Booger is a 10 year old Poodle Mix who is very quiet but is a social butterfly when around other dogs. His human stated that Booger’s favorite thing to do is sleep. 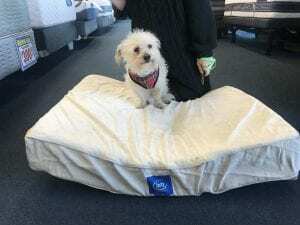 There’s no better gift than a new Serta Memory Foam pet bed courtesy of Best Mattress. Best Mattress is a proud sponsor of The Nevada SPCA.